We are back on SV Villa G now after 3 nights away. Last Wednesday afternoon we temporarily moved off of SV Villa G to an AirBNB "Tropical Garden Cottage" in Nightcliff. That's a suburb of Darwin about 15 minutes drive away. We have been using AirBNB when possible and have been very pleased. 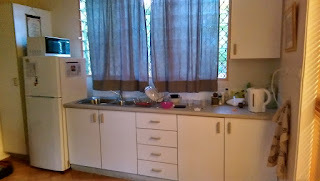 Last year we stayed with a family also in Nightcliff, but their apartment was not available for this haulout. 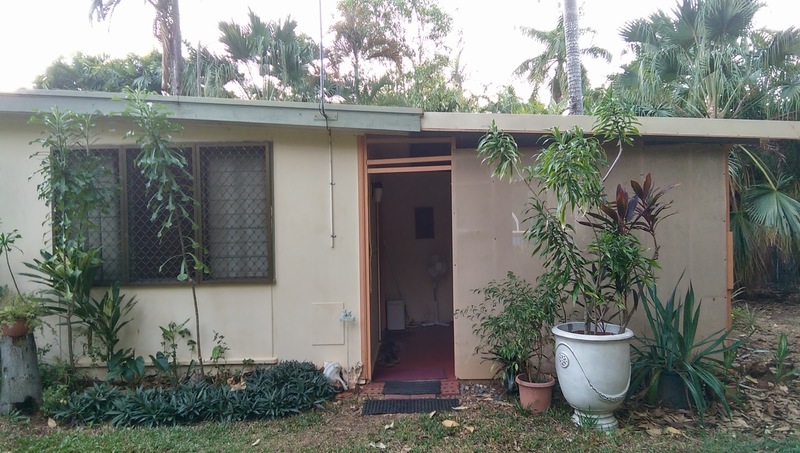 The cottage was located in the backyard surrounded by tropical trees and flowers. While the facility was quite simple, it was more than sufficient and the owner, Tess McPeake was very nice and had all in good order. She originally moved to Darwin in the late sixties as a kid and has been elsewhere in Australia a great deal of the time. Tess was a fountain of knowledge about Darwin and things Australian. 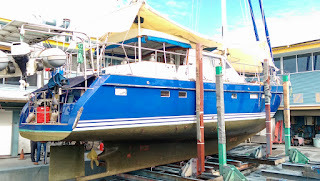 We hauled SV Vila G here at the Cullen Bay Marina Slipway which is operated by Jeff and Kaye Dunn. It is so easy to work on your boat here and they have staff who are able to help as needed. 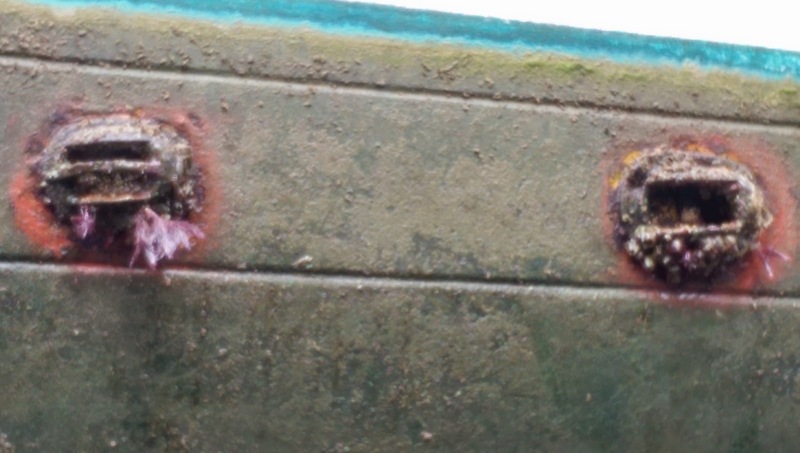 In general we found all well with SV Villa G. There were a few barnacles around some of the thru-hull fittings, but generally pretty clean. I had dove on here about every 2 months and scrape accumulated growth while we were up in Indonesia. 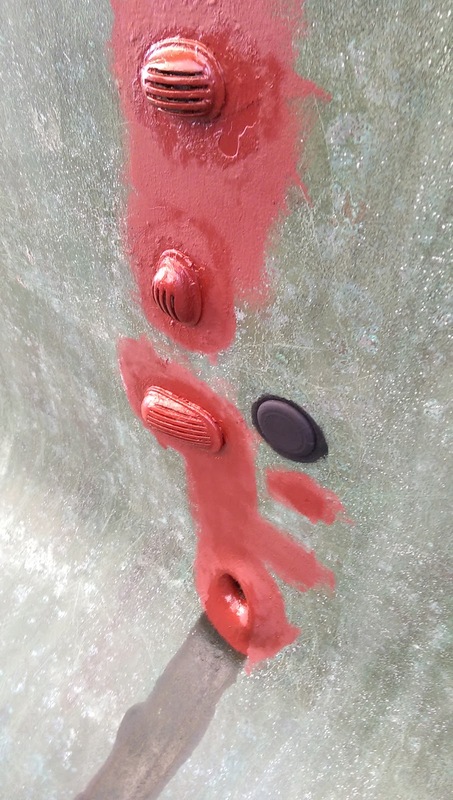 Underwater surfaces are painted with Copper Coat composed of 60% copper microbeads suspended in epoxy. This was put on SV Villa G 3 years ago in Phuket. By and large it is holding up pretty well; however, around the bronze thru-hull fittings and the places we have dinged on coral there is a need to scrap a bit and cover with conventional anti-foul paint. 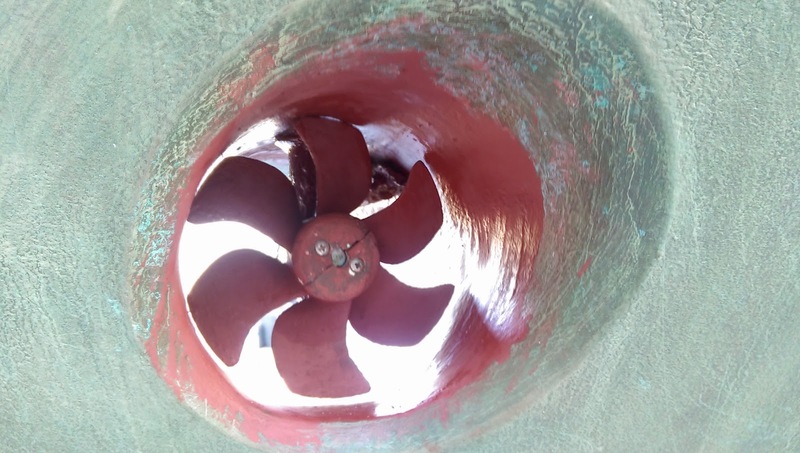 After Spencer powerwashed everything, he sanded off the prop and re-coated it in Prop Speed, a miracle product that keeps the marine life off the prop. Our propeller is bronze so barnacles and all manner of marina love to make home there. 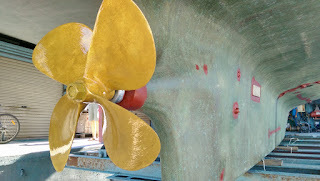 We have found that Prop Speed does a great job, even it is an ugly yellow green color. I don't know what it is chemically, but the yellow stuff is a primer coat and then the protective material is a slippery clear coating. 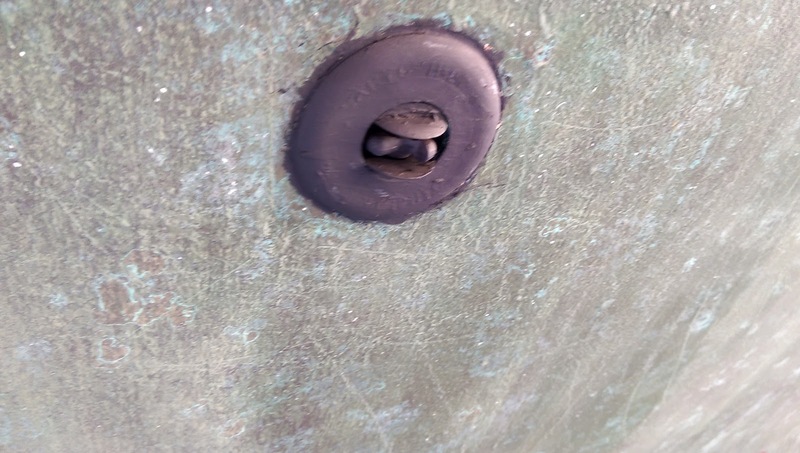 Susan spent the best part of two days using a scouring pad and rubbing the Copper Coat finish. This removes some of the epoxy and exposes more copper to inhibit growth. 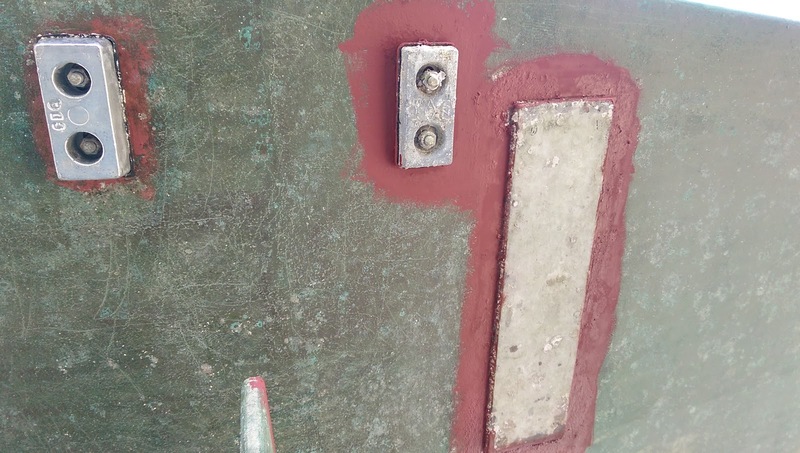 We also sanded the grounding plate for the HF radio (seen to the right) and replaced some of the sacrificial zinc anodes. 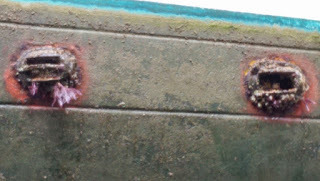 An essential reason for hauling out of the water was to replace the main depth sounder, seen above with special black anti-foul paint. This is a new super-dupper Raymaine unit that should be able to detail the sea bottom and even see fish! The black thing above is a small paddle-wheel that transmits a signal to the instruments to tell us how fast we are going through the water. We have had it onboard, but never installed it. Previously we had a fancy ultrasound speed reader, but it only worked about 15 minutes, so while out of the water we put this old fashion device back in and we can confirm now that it is working. 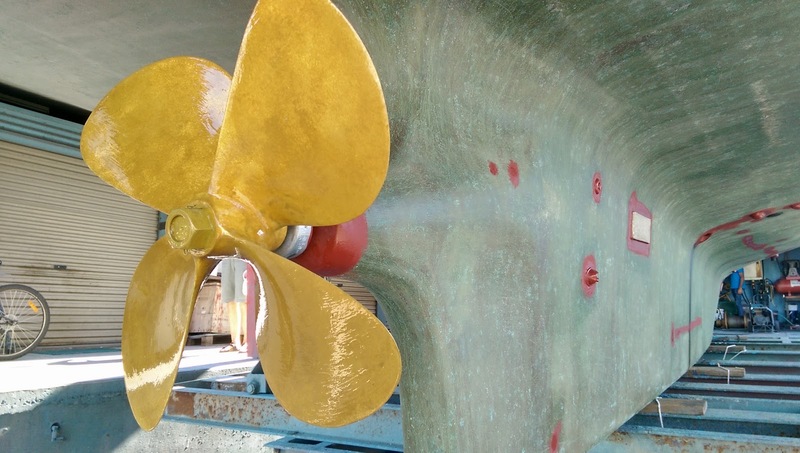 A bow-thruster. SV Villa G has a long keel and is difficult to turn when standing still or going slowly; however, this small prop in the bow allows us to turn on a dime. It is electrical and does a great job. It is all covered in red anti-foul paint here. This is also a good picture to see the greenish blue color the copper in the main bottom coating. I've been told that the top-coat of PropSpeed is a special variety of silicon.